The Small HD DP6 is easily one of our favorite field monitors. 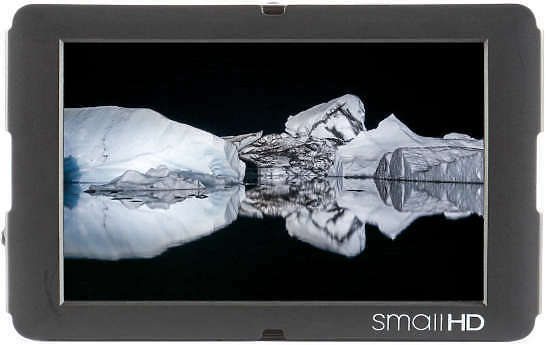 It sports a 5.6" high definition display (1280×800), 170° viewing angle, and strong aluminum construction. Integrated HD-SDI Loop-Through. This feature allows a user to pass through an HD-SDI video input to another monitor for a second user. Further connectivity options include both HDMI and Component inputs. Separate HDMI Splitter. This model includes a separate HDMI splitter for those that might need to share their HDMI source with another monitor. Power Source. The DP6 is powered by dual, hot swappable, Canon LP-E6 batteries; these are the same batteries used in Canon’s 5DmkII and 7D HDSLR cameras (one battery included, more may be rented here). Additional features include image flip, auto/manual scaling (fill the screen with your HDSLR), peaking focus assist, adjustable on-screen markers, false color exposure control, and 1/4-20 threads on any side of the monitor for more flexible mounting.